Our garden has exploded with Zucchinis this season so I went looking for some new recipes. and boy is this cake and chocolate whipped cream good! To make this cake Gluten-free I used Bob’s Red Mill Gluten-free 1 to 1 Baking flour and the only other change I made was I used dark, unsweetened cocoa powder since that is what I had in the pantry. I sent the leftovers with the husband to his work and his coworkers loved it and I received multiple requests for the recipe. So, thanks to Mel’s Kitchen Cafe for posting the recipe and whipped cream. I will definitely be making this recipe again. Do you have a garden? If so, do you grow Zucchini? I made a slightly modified version of this recipe tonight and it was a hit. So, I figured I would share and post it here so I don’t forget where I found it. Do you watch/ listen to YouTube bloggers? Well, I have found some I really like, but that list will be for a post in the future. I actually had two cooked, plain, shredded chicken breasts in the fridge that I didn’t have a plan for. So, I put the shredded meat in a saucepan and made the sauce with the addition of the juice from one Halo mandarins. I then simmered it on medium-low for about 30 minutes. After than I followed the actual recipe. The husband commented on how good the house smelled when he came in the door and was more than happy to eat three tacos with this meat in them for dinner. So, let me know if you try it and if you liked it. This is definitely going in my list of Go To meals. Note: I got nothing from Grocery Outlet (or any of the brands listed) for this review. I am just really happy that the Grocery Outlet opened in our town. Since my favorite grocery store closed last year I have been bouncing around the local stores and Costco for my shopping. I was happy when a Grocery Outlet opened locally. I knew from extended family (and other blogs) that they didn’t always have everything, but when they had something they usually had a good price on it. Did you know that each Grocery Outlet is locally owned? The statistic is that for every $100 spent in a local store $45 stays in the community. I am definitely willing to try the local stores to keep the money and jobs here. So, here are some of the items we have been buying there lately. 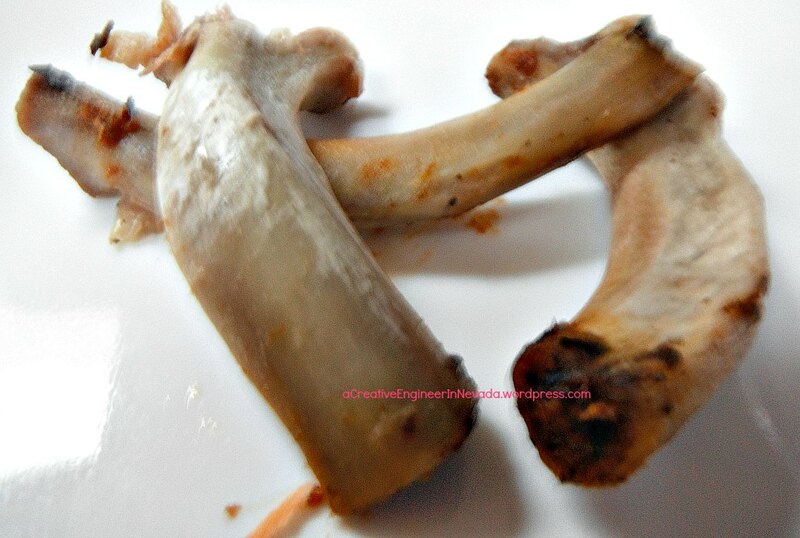 Organic chicken legs – I got a great price on these (I cooked them up the same day and took them on our camping trip a month ago). Frozen Ore-Ida potatoes (I just picked up a bag of Zesties for $1.49 for the first time today so I will let you know what we think). Hummus – Since I am the only one in the family that really likes hummus I bought a container for a great price (don’t remember the cost now since it was a month ago), and then froze it in smaller containers. They also have bags of Gluten-free All Purpose Flour and other gluten free mixes which I am thinking of trying in the future. So, now I stop at the local Grocery Outlet before I head to any other grocery store. Let me know if you try them out and what bargains you found. So, for a few years now we have eaten Udi Gluten free bread. The family likes it toasted and plain (when we rarely eat a sandwich). Up until now we have been buying it at Trader Joe’s. Well, this spring Costco (yeah!) started carrying a larger loaf in the frozen food section (in ours it is near the frozen berries – who would have guessed). Anyways, I had seen coupons for Rudi Gluten free bread, but had never seen it in a store. Well, the last time I was in Walmart (yes, I go there now, but not often) I went looking around and I found Rudi Gluten free bread in the frozen food section so I picked up a loaf. The first time I tried the Rudi Gluten free bread I made it into toast. It was tasty and didn’t fall apart. On Father’s Day we took a picnic so I took some Rudi Gluten free bread (frozen when we left the house, but defrosted by the time we got there). I hate to say it, but the bread fell apart as we were eating it. So, even though I don’t go to Walmart often I will be using the coupons I find to get some reduced gluten free bread for making toast in the mornings. Oh, and both Udi and Rudi Gluten free bread are made in Colorado. What new gluten free products have you tried lately? Well, I have worked on a couple of posts in the last few days with the intention of posting at least one soon. But, I made these amazing Chicken Drumsticks (gluten free even) tonight so I had to share it first. I made a couple of minor changes since I didn’t have a pan that could be used on the stovetop and then put in the oven. b) I ended up cooking the chicken at 375 degrees F by accident (and my chicken drumsticks were really meaty) so I cooked them for 45 minutes. Oh, and I added the link to my ‘Links to other peoples gluten-free recipes’ page which is under ‘Gluten free pages’ so I can also find it easily in the future.